It’s curves are a wonderful sight and create a one of a kind piece. None of your friends will ever have a slab just like yours! Live-edge countertops can be used in both residential and commercial projects. Not only is it a great element to have in your kitchen, it can also be included in your bathroom, butler’s pantry, bartop and office space. 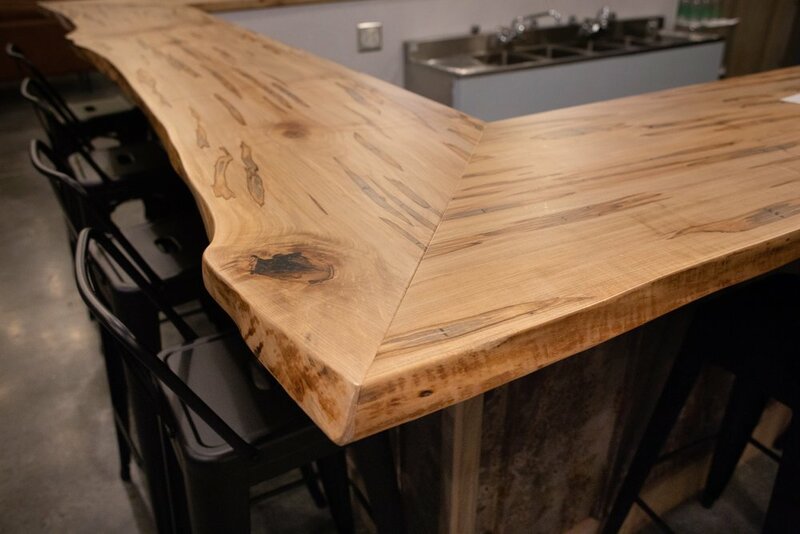 If you are looking to incorporate the Live-edge surface into your space, we can currently craft the countertop with Ambrosia Maple (a lighter tone wood) or Black Walnut (a darker tone wood). Curious how to bring a Live-edge surface into your space? When you fill out the form to Get a Quote, let us know the wood species you want and the dimensions you need to cover the surface. We will find a slab, or multiple if needed, to meet your measurements. After sending you images of the slab and approval of the estimate, we will begin fabrication. Once we receive payment, we can begin fabrication and you can be proud of the space you get to enjoy! Ready to begin your project and include a live-edge surface? Get a Quote and let’s get started.